Slips and trips are the most common form of injury at work, accounting for one third of all major injuries and 40% of injuries involving slips and trips occur to members of the public. According to HSE the majority of these were slips, which occurred when flooring was contaminated with water or grease. The workplace (health, safety and welfare) regulations 1992 require floors to be in good condition and for people to be able to move around safely. Therefore slip risk assessments can be extremely helpful, especially in the marine industry where flooring is likely to get wet. 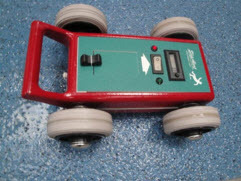 We use the Slip Alert test which is recognised by HSE as providing valid results and as a useful tool for obtaining a measure of coefficient of friction, risk assessment and the monitoring of floor surfaces. This enables us to help our customers monitor their existing floor and choose more suitable lower risk flooring. We also use the Slip Alert test to produce slip deterrent resin flooring. We complete all tests upon non-wet and wet surfaces to help surfaces remain low risk when wet. 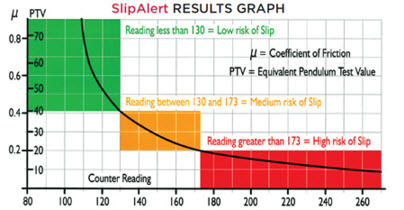 The Slip Alert test results can also be modified across to Pendulum Test Values for comparison purposes. We provide a full report which includes the location of tested area's, the average of the runs for each location, both wet and dry and the corresponding values for the Coefficient of Friction, Pendulum Test Values and the result for the risk of slipping.